J. Mogensen is one of the 20th Century’s most important potters and sculptors. Mogensen trained at the Art Craftsman School in Copenhagen, and then studied for a period in Paris. He started his professional career as a potters apprentice with Royal Copenhagen in 1949. He worked with iconic figures such as Knud Khyn, Axel Salto, Gerd Bogelund and Nils Thorsson. 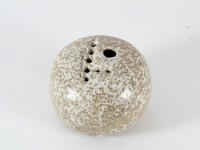 During the 1950s he produced several series of stoneware for the factory. These series-produced wares are typical of the 1950s with their semi-abstract bird motif and most of them are covered in a matt brownish glaze.His figures of animals were influenced by a visit to a Mexican exhibition in Sweden – and it had such influence on him that he developed his own style based on it that was to stay with him for the rest of his career. In 1965, frustrated with working at Royal Copenhagen – Mogensen started his own studio where he produced highly original pottery and monumental sculpture – most of which was in a “primitive” Nordic style which demonstrated his great skill at combining sculpture and ceramics. Production ceased in this studio around the late 1980’s. These pieces are signed with his easily recognisable signature and usually “Denmark” stamped on. In 1991 Mogensen retired from Ceramics and painted until 2003.